Your Land Rover takes you safely over, through, and across all types of terrains. It’s the perfect combination of luxury, sophistication, and rugged off-road travel. Our service experts will treat your Land Rover like the unique SUV that it is. Rocco’s European Garage in Marietta, GA uses the latest technologies and service techniques to give you the best on- and off-road driving experiences. When you take your Land Rover on an outdoor excursion, it’s smart to put a trip to European Garage at the top of your to-do list. Our ASE Certified technicians will design an preventative maintenance service plan. These plans allows us to analyze any performance issues that have you concerned. We’ll keep you two steps ahead of any repair need or breakdown. Let our Land Rover experts provide all of the oil changes, tune-ups, fluid services, filter changes, maintenance inspections, engine diagnostics, and tire services that are necessary. We’re the Marietta, GA area’s best option for top quality Land Rover repairs. Our technicians look forward to the opportunity to service the automotive industry’s premier SUVs. Your Land Rover may encounter a variety of repair needs from normal road travel. Keep our team on speed dial, to handle any performance issues. We consider you our partner in exceptional auto repair and maintenance services for your Land Rover. Experience a higher standard for your Land Rover’s driving and service experiences. We have you covered from bumper-to-bumper, making sure you stay road-ready and off road-ready. Rocco’s European Garage has a highly qualified team using state-of-the-art tools and equipment to provide the best Land Rover repairs possible. Bring us any engine repairs, transmission services, brake repairs, steering and suspension repairs, exhaust system repairs, wheel alignments, A/C repairs, and much more. Our techs stand confidently behind all of our Land Rover repair services with a quality service guarantee–12 Months / 12,000 Mile Warranty. Schedule Your Land Rover Repairs With Us! Remember, timing is everything! The number one cause of performance issues and repair needs is vehicle neglect. We count on you to let us know what may or may not be wrong with your vehicle. Our team will get to the bottom of any question or concern that you have. Or even better, just bring your high-end SUV by no matter what. That’s the only way we can ensure enhanced driving experiences, an extended road-life, and the protection of your Land Rover’s value. Give us a call today at 770-795-7575 to schedule your next Land Rover repair appointment. You can save time by scheduling right now using our convenient online scheduling system. 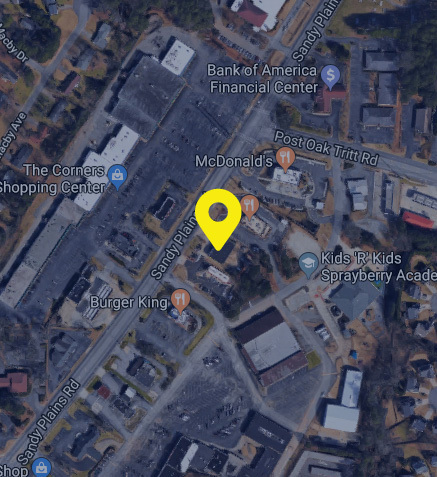 Next time you’re in the area–2746 Sandy Plains Road–feel free to stop by! We gladly welcome all of our walk-in customers.